…it were possible to model the magnitude of effect of a therapeutic intervention relative to existing standard-of-care, and thereby to estimate the commercial market of an as-yet-to-be-approved drug? This is the concept of programmable therapeutics. And this is the concept that appears to be emerging – slowly! – from studies such as that published recently in the New England Journal of Medicine (see here). In this blog, I review the NEJM study, highlighting the wonderful science as well as pointing out important limitations. Then, I discuss the claim that an siRNA therapy will be tested in humans “in the clinic next year” (here). This harkens the dawn of programmable therapeutics. Finally, I conclude with ongoing efforts that aim to make programmable therapeutics a reality within the next decade (or so!). Abul-Husn et al NEJM 2018. The study, led by researchers at the Regeneron Genetics Center and Geisinger Health System, used exome sequencing to test protein-coding variants for association with liver enzyme levels (AST and ALT) in nearly 60,000 individuals of European ancestry. 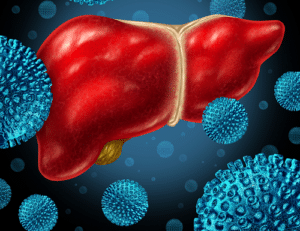 They identified variants within genes previously reported to be associated with liver disease: PNPLA3, TM6SF2, SERPINA1, SAMM50, and ERLIN1. They also identified variants in genes not previously reported to be associated with liver disease: GPT and GOT1, the genes encoding ALT and AST, respectively, and SLC39A12. But most interestingly – and the primary focus of the study – they identified a common (26% allele frequency) insertion polymorphism adjacent to a donor splice site of exon 6 (rs72613567:TA allele) in a gene, HSD17B13, from the hydroxysteroid 17-beta dehydrogenase family. To explore the pathological consequences of the HSD17B13 rs72613567:TA variant, they performed tests of association in 2,391 persons with liver biopsies from a bariatric-surgery cohort. Among those with steatosis, rs72613567:TA was associated with lower odds of nonalcoholic steatohepatitis (by 13% among heterozygotes and by 52% among homozygotes) and lower odds of fibrosis (by 13% among heterozygotes and by 61% among homozygotes). Thus, the HSD17B13 rs72613567:TA allele was not associated with simple steatosis but was associated with a reduced risk of nonalcoholic steatohepatitis and fibrosis, findings that suggest that this variant allele protects against progression to more clinically advanced stages of chronic liver disease. To determine if the HSD17B13 rs72613567:TA variant is associated with other clinical phenotypes, the performed a phenome-wide association study (PheWAS) of novel trait-associated variants with 405 quantitative clinical measurements and 3168 clinical diagnoses. They identified significant associations of HSD17B13 rs72613567:TA with higher platelet counts, a phenotype likely related to liver disease rather than an independent effect on platelets. Although the variant is associated with “protection” from liver disease, the direction of risk vs protection is meaningless unless anchored in function (e.g., gain-of-function, loss-of-function). Therefore, to explore the functional consequences of the HSD17B13 rs72613567:TA variant, they analyzed mRNA and protein expression. The generated RNA-sequencing data that indicated that the HSD17B13 rs72613567:TA variant altered mRNA splicing, resulting in the synthesis of a truncated protein with substantially reduced protein abundance in human liver. The wild type allele leads to preferential expression of “Transcript A”, which encodes for full-length protein. In contrast, the HSD17B13 rs72613567:TA variant leads to preferential expression of “Transcript D”, which is predicted to result in premature truncation of the protein. Consistent with this hypotheses, they observed reduced levels of HSD17B13 protein levels in the liver of HSD17B13 rs72613567:TA variant carriers (see Figure 5). Together, these data support the genetic hypothesis that loss-of-function of HSD17B13 protein protects from fatty liver disease. The mechanism by which protection occurs, however, has not been elucidated, but may involve the formation of bioactive lipids or an effect on de novo lipogenesis. But there are important caveats to the study. Unfortunately, little is known about function of HSD17B13. While overexpression of human HSD17B13 has been shown to increase lipogenesis in mouse liver (see PNAS 2014 study here), an Hsb17B13 knock-out mouse has the opposite phenotype observed in for the HSD17B13 rs72613567:TA variant: loss-of-function in the mouse KO increases liver steatosis and inflammation (see FASEB 2018 study here;). The NEJM manuscript does not reference this mouse knock-out study (which was only just published), so there is no effort to explain the potential difference between human and murine loss-of-function. (4) Different variant: The rs72613567:TA splice variant is tagging another variant, which is causal and acts either via a different mechanism (e.g., increased gene expression) and/or a different gene (e.g., HSD17B11). It is important to note that HSD17B13 is in close physical proximity to HSD17B11, a member of the same gene family (78% homology between the two) but with broader expression across tissues. Thus, it is possible that one gene is responsible for the phenotype in the mouse, and another gene is responsible for the phenotype in the human. To resolve these discrepancies, it will be important to understand the impact of the HSD17B13 rs72613567:TA on human physiology. Perhaps the simplest approach is to recall healthy individuals homozygous for either the wild type or rs72613567:TA variants and test for evidence of dysfunction in de novo lipogenesis or fatty acid esterification. This was not done in the current NEJM study, and it would be a logical next step. My prediction is that such a study would support the observation that the protective HSD17B13 variant is indeed loss-of-function in humans, and that the physiology between the mouse and human are somehow fundamentally different for this gene and pathway. Era of programmable therapeutics. Realization of this concept, which is still years away, would change the paradigm of drug R&D. Rather than agonizing over the causal human biological evidence to support a target, and then spending years inventing a molecule that is optimized in an artificial pre-clinical model system, only to test it in humans for a critical Go / No Go decision, the “programmable therapeutics” world of the future would take a molecule already optimized directly into a human proof-of-mechanism clinical trial. This would require a library of therapeutic molecules developed and optimized without prior knowledge of a genetic mutation – or even any compelling biological hypothesis. These molecules, in effect, would be just waiting for a compelling therapeutic hypothesis to emerge in order to test a mechanism in humans. The mechanism tested in humans would be directly supported by human genetic evidence – and more precisely, the pharmacodynamics biomarkers would be directly linked to the human genetic mutation (e.g., alterations in de novo lipogenesis for HSD17B13). I know – such a programmable therapeutics world seems years and years away, as such a library of optimized therapeutic molecules seems incomprehensible. And I also know that such a world may never materialize, as it is not obvious how to get there. Nonetheless, I believe we should set our sights on such a future state. Moreover, as described below, there are numerous initiatives that are underway that should catapult us into this future state. – Recently, Neil Risch and colleagues published a manuscript examining genetic determinants of lipid levels in the Kaiser Healthcare system (Nature Genetics study here). – Josh Denny and colleagues report phenotype risk scores at the Vanderbilt University Medical Center (Science study here). – Recently, Eleftheria Zeggini and colleagues reported on the genetic architecture of osteoarthritis, using data from the UK Biobank (Nature Genetics study here). – The US-based All Of Us research program is only now beginning to launch, with the goal of enrolling a million citizen scientist over the next 5 years (see controversial NYT article here). – FinnGen, a recently launched public-private partnership, aims to generate genotype-phenotype data on up to 500,000 individuals from Finland (here). – Estonia, in partnership with Illumina, recently announced free genetic testing for those who enroll in their National Personalized Medicine program (here). – Israel recently announced a big data health initiative, although it is unclear if this initiative includes generation of genetic data (here). – Amgen published a study on bioRxiv that describes the connectivity between 1,394 drugs with phenotypes associated with genes encoding drug targets and side effects observed in >31,000 clinical trials, for a total of 38,199 drug-side effect combinations (here). The second set of initiatives involves rapid interrogation of variant / gene / pathway function. This effort is lagging behind genetic biobanks, as it is very difficult to standardize functional assays across genes and pathways. Each gene appears to have its own, complicated story to tell! Nonetheless, progress continues, including efforts such as Open Targets and the NIH-sponsored Accelerating Medicines Partnership (AMP). Finally – and what I think will be the ultimate bottleneck for programmable therapeutics – is the ability to build a library of “off-the-shelf” therapeutics that have been optimized for human clinical studies. Such a library, if feasible, would enable the ability to take a molecule that recapitulates causal human biology implicated by human genetics and rapidly (Days? Weeks? Months?) test that therapeutic hypothesis in humans. But there are hints of progress that such a library may be possible to build. Beyond conventional small molecule screens to find inhibitors of enzymatic function, there are entirely new modalities that have led to the regulatory approval of new drugs (here). For example, siRNA has shown progress, especially for liver targets, and is the modality selected by Regeneron and Alnylam to target HSD17B13 (here). Other modalities that have the potential to become programmable include protein degradation technologies (see nice recent review on “chemical-induced proximity” in Science here, another on targeted protein degraders in c&en here), cellular therapeutics, and many others. In conclusion, we are still far, far away from a world in which there are programmable therapeutics. But I think the NEJM study provides hope that we will reach such a world in the not too-distant future.